If you were a horse, setting out to pick your ideal livery yard, what would be on your list? 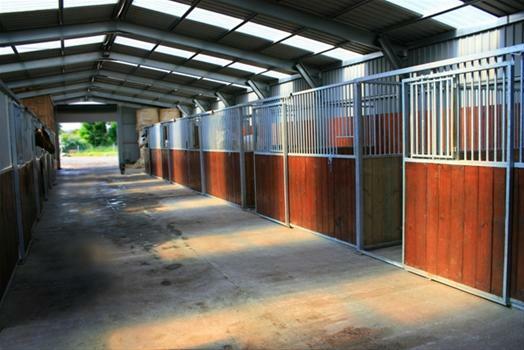 For us humans, there are lots of important priorities - location, parking, a friendly atmosphere, good facilities, competitive prices - but, if you were a horse, where would those come on your agenda? 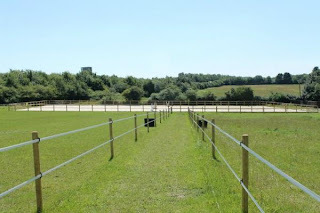 Livery yards often have fabulous selling-points - state of the art stabling, individual turnout, immaculate arena surfaces and paddocks - and when accompanied by gorgeous photos like these, they win us over. But try putting yourself in your horse's position and assessing what is important from his point of view. I know from both my own horses and the rehab horses that they enormously value being part of a herd. They have likes and dislikes but company and being with a group is valuable to them. 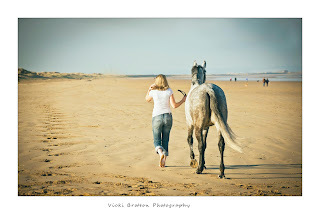 There is the odd horse who is a true loner but they are rare. Normally, even the singletons are happier when they are on the fringes of a herd. 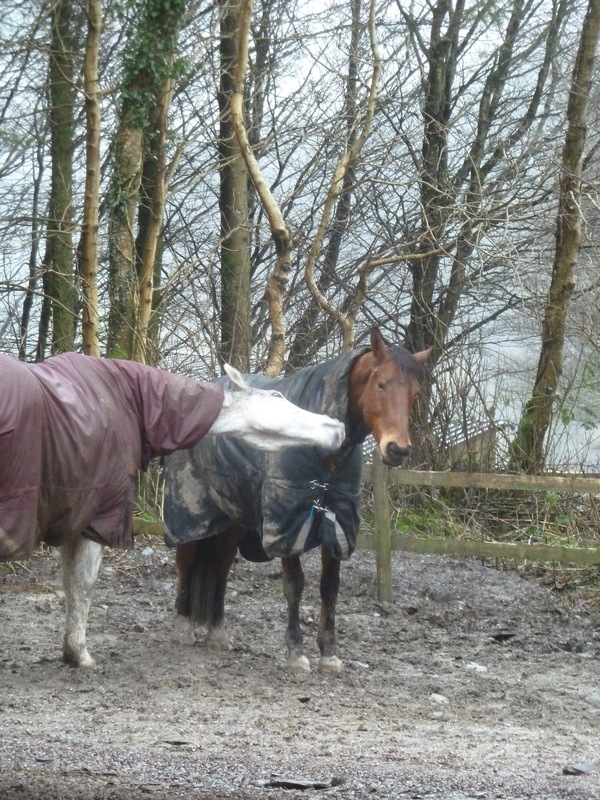 But when left to their own devices, companionship is still key for them. 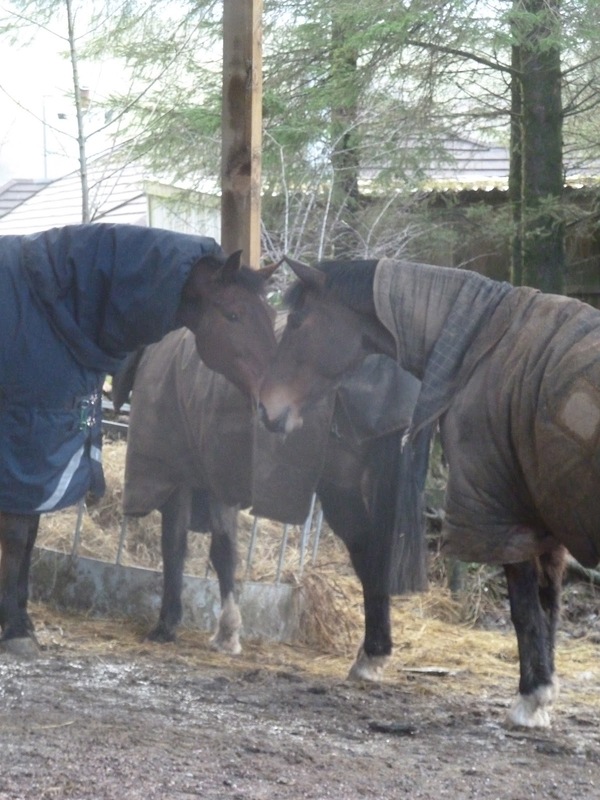 Horses don't segregate themselves when they seek out shelter - I took this photo one winter night and its not uncommon to find 3 horses sharing this space overnight. Look at horses in a field - they aren't spread evenly about but clustered in groups. 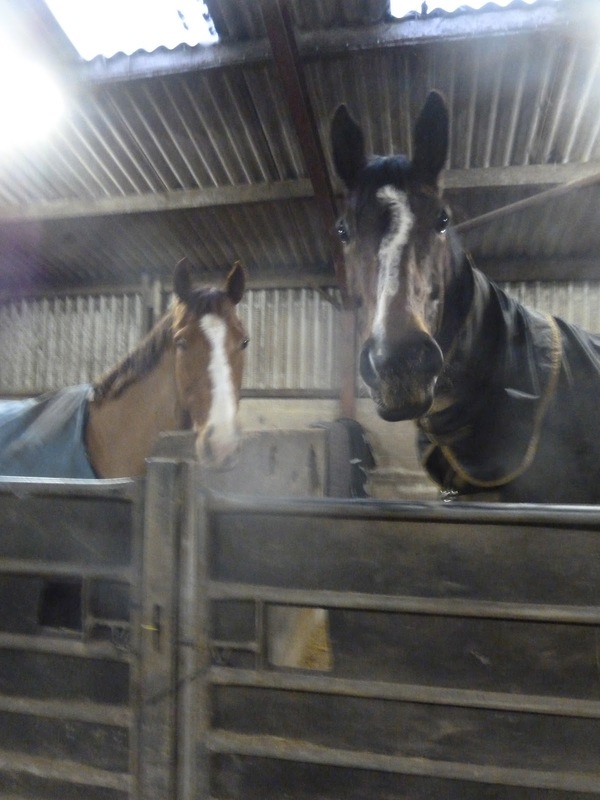 As I posted Red's pics on Friday it seems only fair to post an update on Beanie - who also arrived 2 weeks ago. Every horse is different but its interesting to see how - like Red - he is already building up his frogs. ...but look at his toe and the back of his foot. ...a lovely photo of Domino, who was here last year, looking very smart schooling with a friend over the weekend. Red arrived here 2 weeks ago and of course I have photos of her from the day she arrived. 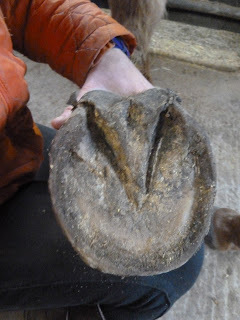 Better still, thanks to Sez (aka Oberon), Red's earlier photos have also been posted to me via Facebook, and the history of her hooves over the last 6 months, including her remedial shoeing, is very interesting. 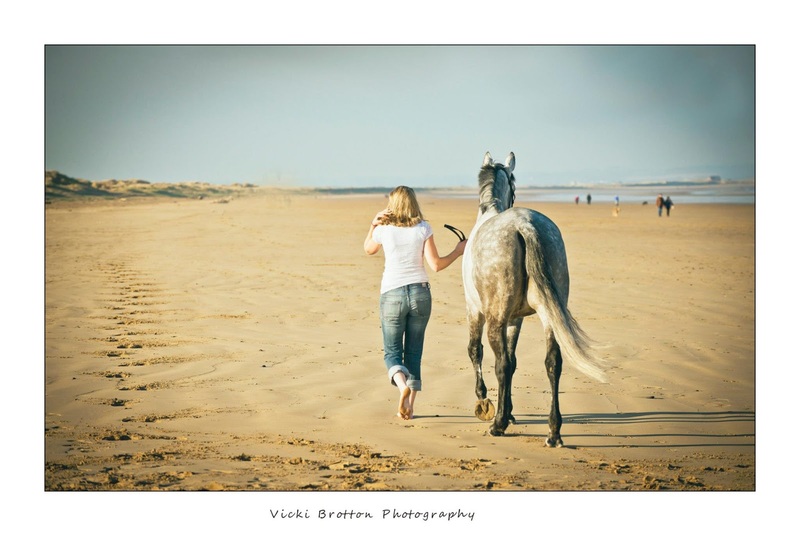 I'm going to let the photos speak for themselves and give you the dates - the first is when she was in bar shoes, in August 2012. Now its November 2012 (hint: she has already made progress). and today, nearly 2 weeks later. ...and today - move even loading and much more substantial. Which foot is the better for shock absorption and balance? Did the bar shoes actually provide support? Beano will be going home on Friday so its time for his last update. 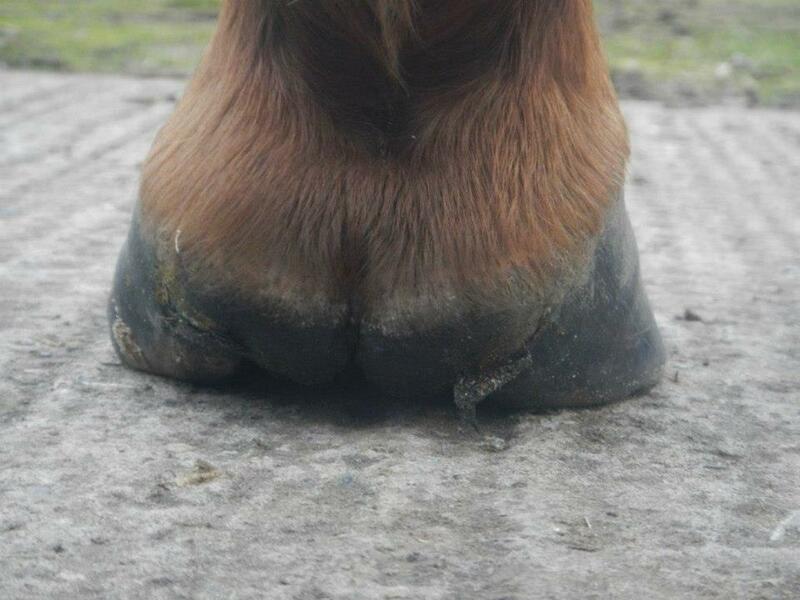 As is often the case, its only when I brought up his most recent photos compared with his previous ones that you get a true picture of what is happening with his feet. Here he is on day one - not a bad foot but relatively long toes and slightly under-run heels. Still, lots to like and a pretty healthy foot. 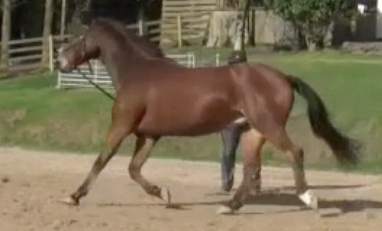 ...but look at him today and the hoof/pastern axis is perfect again. 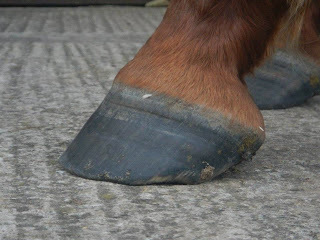 That's because there is now more support for the palmar hoof (you can see that its more substantial now) and that, combined with the shorter toe, has brought the foot into a more supportive position under the limb. To look at his toe - compared to 3 weeks ago - it looks for all the world as if I have dug out my rasp and rolled his toe. I haven't :-) That's him wearing his break-over for himself. Very nicely he has done it, too, and you can also see that it is perfectly in line with the angle of the new hoof capsule. 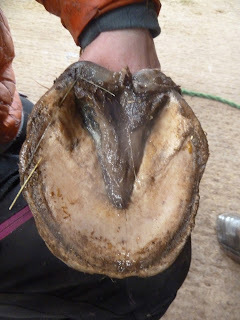 Its a really good example of how a hoof will grow and wear correctly if its given the opportunity to do so. And, more importantly, that a "correct" shape should be the RESULT of wear and stimulus - not imposed in spite of it. Solar views of the same foot are also encouraging. His frog is now much more substantial than on day one and as his frog has strengthened his heels have moved back. Equally interesting is the way his foot is re-orientating. In the first photo his foot is asymmetric on this view - the lateral side is more substantial than the medial side. Yet from the top, his foot looked fine. In the middle photo - at about 9 weeks - his foot is in the process of rebalancing and by the time of today's photos the medial and lateral sides are more even (though the medial heel still needs to improve). It will be fascinating to see how he develops over the next few months. Dave has been a very good boy working over the last week - happy, forward-going and enjoying being out with his new BF, Red, who was also loving the sunshine. So when all I wanted from Dave on Sunday afternoon was a few minutes of footage on a circle which I could send to his vet and owner, I didn't think that was going to be a big ask. or of course demonstrating how much taller he is than I am. 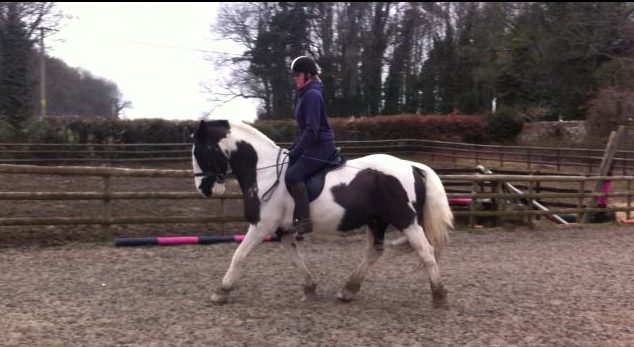 There is nothing wrong with his agility, despite him being at least 19 hands high, and although the photos look dramatic he is a gentle giant - but its a bit like having a Great Dane trying to jump up and put his paws on your shoulders(!). 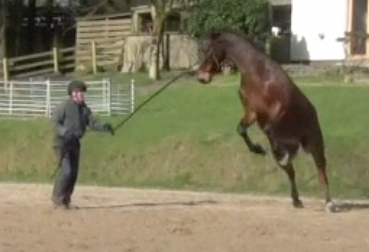 Earlier, Wally had been in a similar frame of mind...again, all I wanted was to see him trotting a circle. 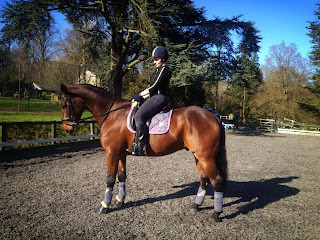 These feet belong to Wally, a KWPN dressage horse who arrived earlier in the week. 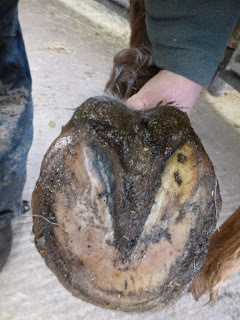 Wally is interesting because although - like most horses who come here - he has been lame for some time in his case the lameness does not block to his feet but to his check ligament. This is exactly the problem that our own horse, Charlie, had before he came here and in his case it seems clear that the strain on his check ligaments was related to his medio-lateral balance, even though the lameness did not present in his feet (there is more about him in this link). 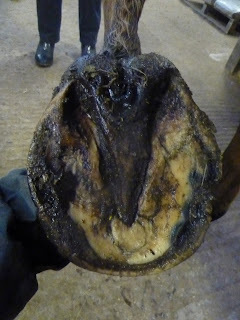 In Wally's case, he had been remedially shod with bar shoes even though there was no apparent issue with his feet but that and a course of conventional treatment has not improved his lameness so his owner, vet and trainer have decided to try rehab from the feet up in the hope of helping reduce the strain on his ligaments. 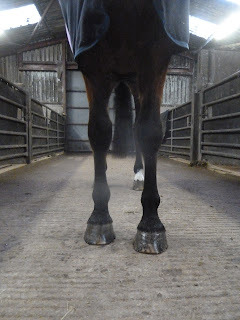 Its certainly clear from the photos that his feet could do with improvement although there is already lots to like in the good frog and strong hoof wall. Interestingly his right foot looks more twisted from the sole view, his left looks more crooked when viewed from in front. Its his left which he is lamer on so it will be fascinating to see how his feet and his stance change over the next few weeks. 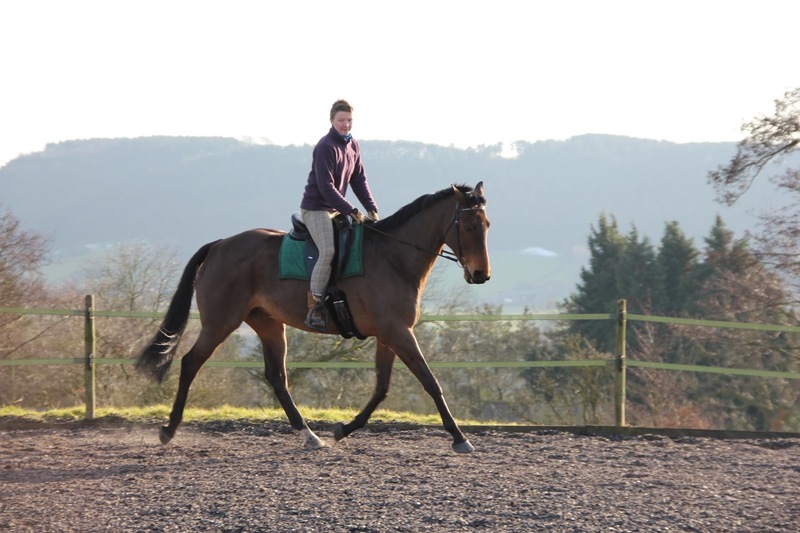 Big thanks to Em, Thomas Two's owner, who spotted Wally's feet and first put his owner in touch with us. I hope he will do you proud, Em! As you can imagine, Valentine's Day dawns just like any other at Rockley - although we had the consolation of some very welcome sunshine and a bit of a rise in temperature, at least. ...and even new boy Wally may be in with a chance with Charlie...! 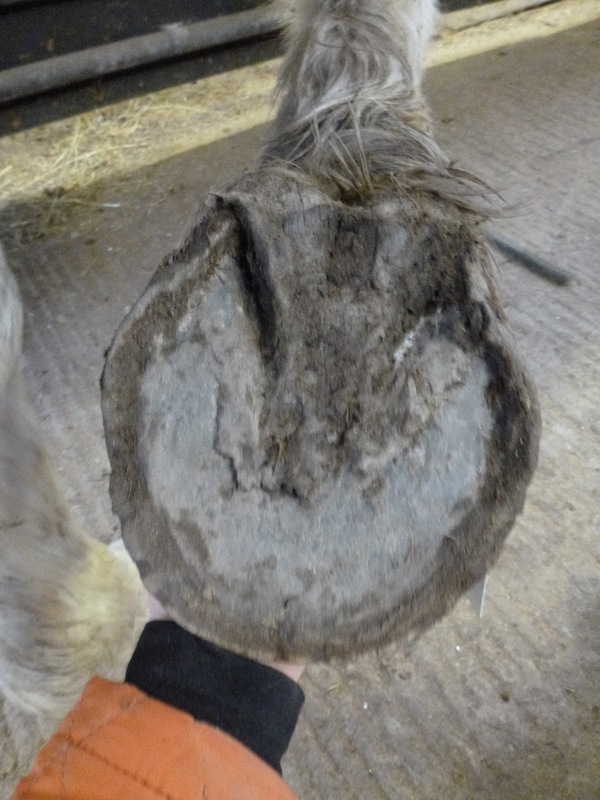 As many of you know, the horses who come here have a range of diagnoses ("navicular", DDFT collateral/impar ligament damage, coffin bone damage) but most have a lameness which blocks to the foot and many have then had x-rays or MRI which of course gives lots more information about what structures within the foot are affected. 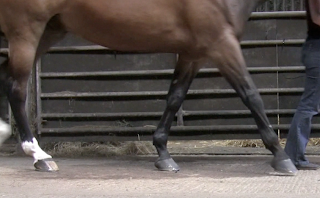 Horses with this type of lameness nearly always have a toe-first or flat-footed landing, when filmed laterally and often also have poor medio-lateral balance as they land (ie they land on one side of the front foot first), when filmed head on. 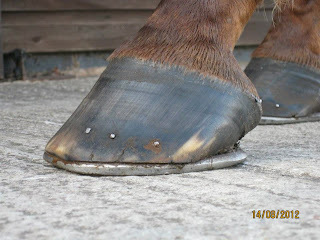 What is very consistent is that as horses become sounder their landings improve and become more heel first and more evenly loaded. 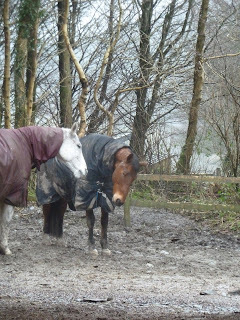 I always film horses when they arrive and there is a clear pattern which is confirmed again and again - look at the footage I took of Beanie and Red, who arrived at the weekend, as a typical example. Buddy, who went home last week, shows what happens as feet begin to become stronger and healthier. Contrast this footage of how he landed when he arrived with footage from the day he went home. A better landing goes hand-in-hand with improved soundness - again something I see repeatedly. 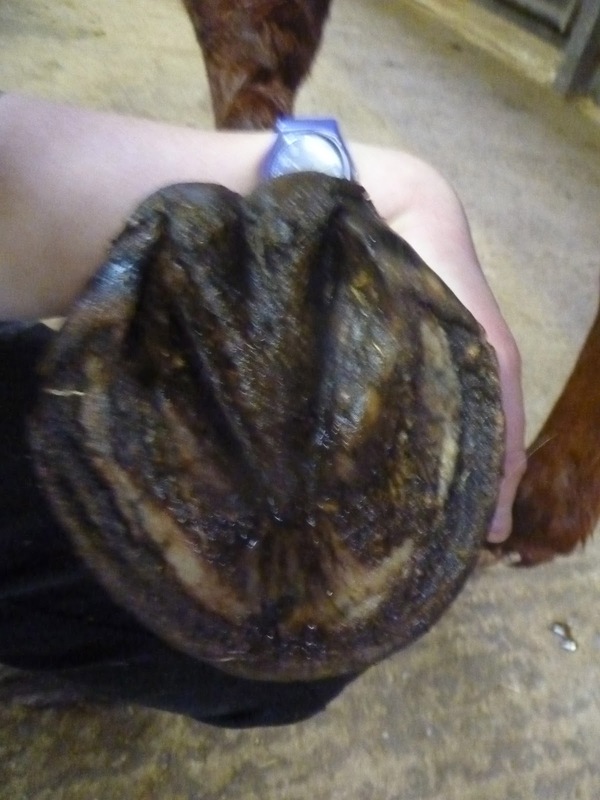 This is after only 12 weeks of change - not quite half a hoof capsule - so imagine how good his landing will be once he has grown in a full new hoof capsule. Its also interesting to see that the issue is not just with his front feet but also his hinds. Not all horses are like this but many are and the changes to the landing in hinds is equally dramatic and equally important. Why is it so crucial to change how horses land? 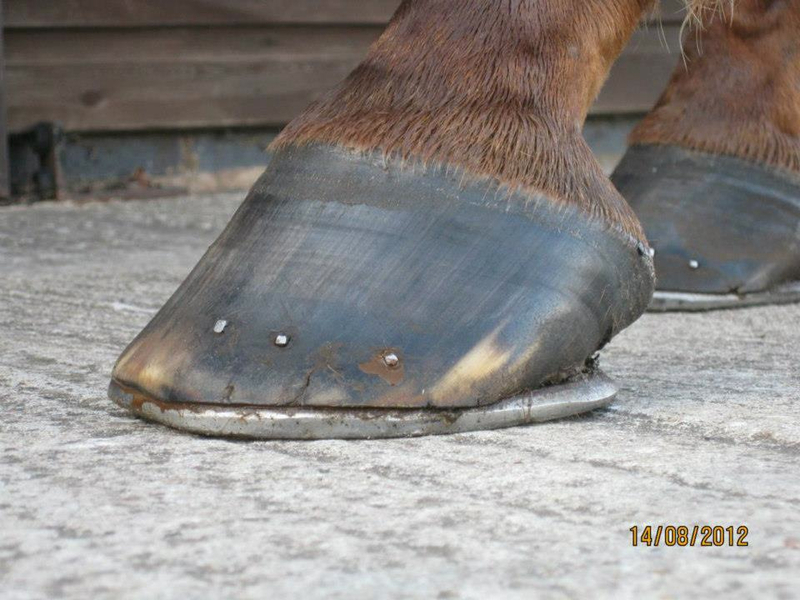 The answer is simple - because it reduces damage to ligaments and tendons and as a result improves soundness. Its of course something I have blogged about many times before - there is more on the anatomy of landings here and more on what happens when a horse continues to land toe-first here and of course you can search the rehab horses to find examples of more footage. 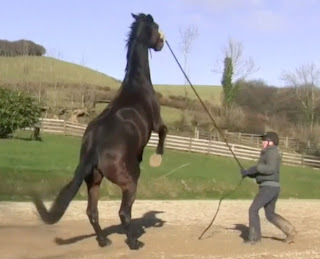 The really useful thing about watching how horses land is that its something that is easily available to any owner, vet, farrier or trimmer. 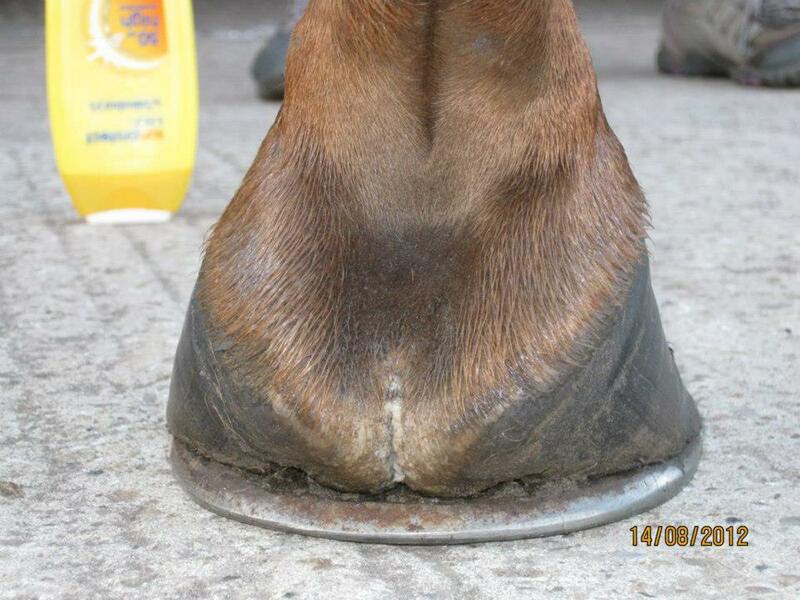 Its not expensive, doesn't require sophisticated equipment and is an effective way of monitoring not only hoof health but biomechanics. How hooves land - while important - is naturally not the only thing you need to monitor with a horse but one thing I am sure of - you ignore a poor landing at your peril! 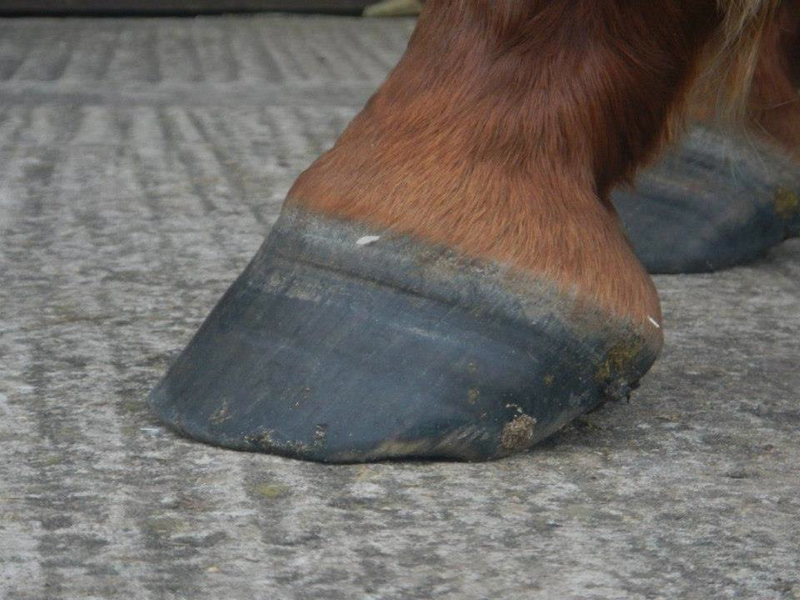 These hooves belong to the second new horse to arrive this weekend - Red. She has superficially stronger feet than Beanie, whom I posted about yesterday but is still landing badly and like Beanie needs to grow much stronger and better balanced feet. You can see from the lower photo that although she has a fairly good frog, her heels are contracted and her medio-lateral balance isn't right. 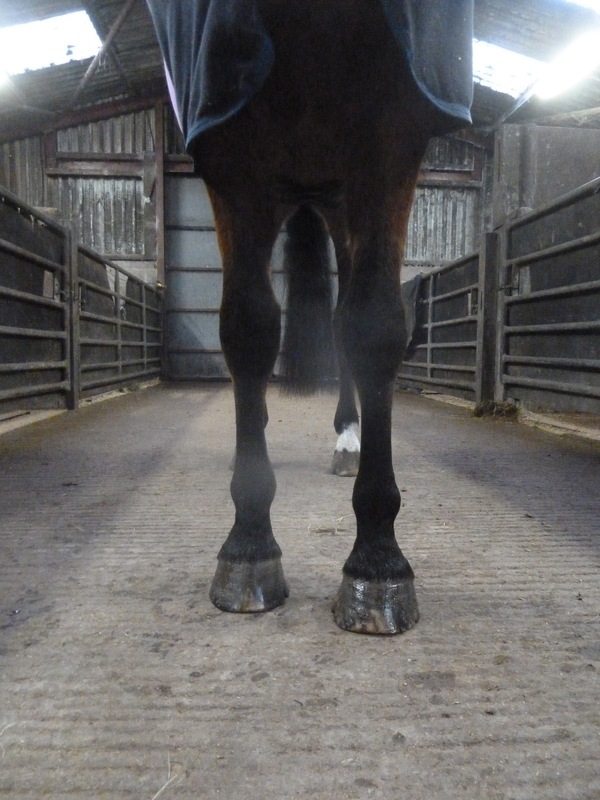 I'm hoping for some good changes quite quickly in her feet so there will be lots more on her soon!